Big news of the week is that EOTopo Vector Preview is now live and free online with a new massive zoom to Level 22. But we've also got our new regular Weekly Catch Up feature highlighting what's new on the website from our user-generated sections of the site. So take a look through the links in this newsletter for some quick highlights to help you stay up to date with what's new at ExplorOz! Go to the EOTopo page on the website to view our free whole of Australia EOTopo maps. You don't need an account, there is no software to download, you can simply view it via your computer using a webbrowser (Chrome browser recommended). NOTE by default the map that is open is not the new Vector map (but the production EOTopo raster tiled zoom map) - so you need to look below that and click the heading "EOTopo 2018.1 Vector". This will open the new Vector map window. Remember, this is a just demo of the VECTOR output system (compared to the RASTER system) but uses the same content. It is not live in production and has been done quickly using an extract of data layers from the current EOTopo data source. Any errors or omissions are not relevant at this stage. Make sure you click the symbol to enlarge the map to full screen for best viewing. NOTE: map data shown here is the same dataset as used in the current EOTopo online system - which is the 2018 release. The most obvious thing that you will notice is the increased zoom to Level 22. Look at the scale symbol bottom left shows 1m. At this zoom you are viewing map scale output of 1:550 (0.55K). As you can see this is ridiculously close and in reality, its impractical so have some fun playing with it. The zoom increments change by whole levels (eg. Level 9 to Level 10) when using the + symbol but if you use a mouse with a scroll wheel, the zoom increments are 0.1 increments, ie. Level 9 to Level 9.1, to Level 9.2 etc. If you are new to using our online map system, note that we display POIs (Places) as a separate data overlay. When Places are close together they are shown in clusters (coloured dots with a number inside to indicate how many Places in that area). Clicking clusters will expand them, as will increasing map zoom levels. In the EOTopo Demo Vector map we load the Places only once you reach Level 10. We managed the Places database live - with over 90,000 POIs currently in the system. You will also notice new Rotate & Pitch (3D) controls. The Vector mapping systems rotates the road name labels etc as you change the map orientation. This is not possible in Raster mapping systems and is a benefit of moving to the Vector system for our map delivery. Fly to - this option is a feature of our demo, allowing you to quickly pan the map to the pre-set locations. Once we have loaded this system into the production mapset users will have the ability to use Fly to for any Place on the map. Press the symbol in the top right to to fly and lock to your current position (will probably work if you have a Wifi connection that picks up your GPS position, or if using a device that uses location services). USER TREKS: 26 new user treks this month. Mostly, these are GPS recorded trip logs from Traveller app users which captures high position data accuracy up to every 10m (even when offline). Not all trips are done in vehicles - one guy is logging his aerial tour of the Kimberley (by light plane and helicopter) - see Darwin-Faraway Bay - Kandiwal Camp - Darwin. A lot of Blogs are now being setup with security protection but here's a few new ones that are visible to all - National Road Transport Hall of Fame, which includes a video clip, and another one also with a video Canning Stock Route. BONUS: If you're not a Member, you might like to also purchase a discounted Membership from our shop AFTER purchasing our app. This discount is automatically applied ONLY if you've installed the app. *Membership will enable you to use the Track Logging feature in the app. do your trip planning, researcing any of the 90,000 POIs or 187 Trek Notes stored in the app - read about history, environment, view driving notes, facilities, advice, get contact details etc. obtain turn-by-turn directions when using the GoTo function to create nav plans in any of the modes (driving, cycling, walking). I.T. Beyond Pty Ltd is our registered company name, which we registered in 1997 (22 years ago). ExplorOz is a registered business name - first registered 19 years ago, when we first started the website. You can read the ExplorOz story - who are we, and how/why did we start ExplorOz from this page on our website - About Us. ExplorOz was conceived by David and Michelle Martin who have been outdoor enthusiasts all their lives. The ExplorOz concept began with a massive two year expedition around Australia in 1998 - 2000 and we have since raised our kids to enjoy the camping/outdoor lifestyle. David and Michelle have never owned a camper trailer or caravan - having preferred the simplicity of swags which we've carried on the roof rack of our 80 series Landcruiser along the CSR, Old Gunbarrel, Tanami, Simpson Desert (4 times), around Tasmania, Old Eyre Hwy, Maralinga, Anne Beadell Hwy (twice), along the Gibb River Road (twice), into Mitchell Plateau, and up to Kalumburu, Cape Leveque (twice) and numerous excursions throughout the Pilbara and South West of WA. Getting away to tackle major 4WD expeditions in the last few years has not been possible (due to home/work life) but things are about to change once again and we have finally conceded that at 51 years old we are ready to enjoy a few more comforts so a camper trailer and vehicle upgrade is now on the horizon (actually, the "new rig" is being picked up next week)! Over the years, when the business had a different focus, we had additional staff, but in recent years the entire ExplorOz operation has been solely run by David and Michelle. When you contact ExplorOz either by Live Chat, email, or phone you will speak directly to Michelle. 3 years ago we ceased retailing/promoting other publishers/developers products to allow time to focus on our offline product development (maps and app). 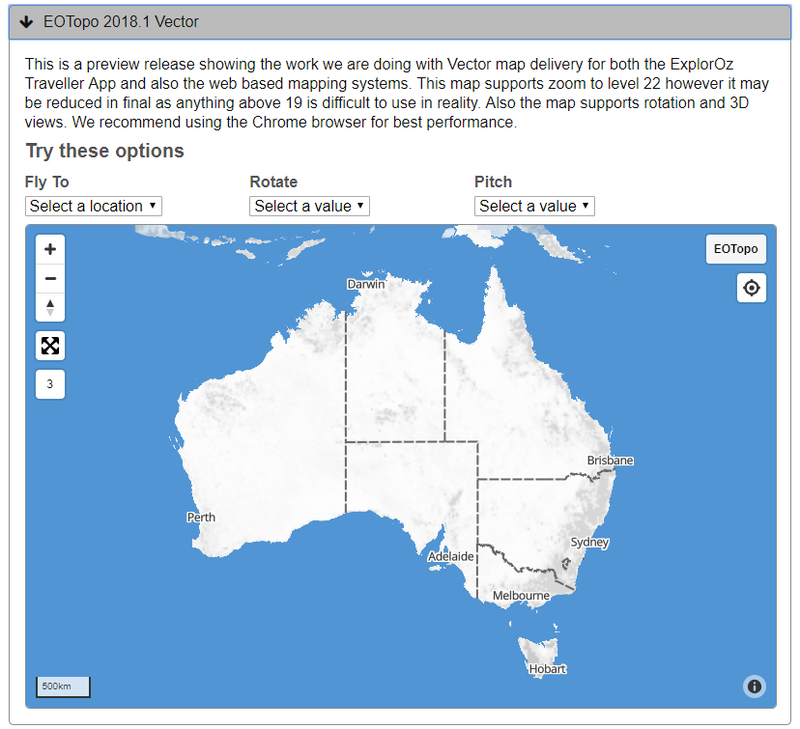 The first ExplorOz product was released for sale in the year 2013, which was the EOTopo raster map dataset. Whilst this was data had been used in all our online mapping services, we hadn't previously made the maps available for download to use offline. EOTopo has had many updates since then (v2013.3, v2014, v2015, v2015.1, v2018) and continues to be our main focus with new & exciting developments planned for the future. The second ExplorOz product was created for sale in the year 2016, which was the ExplorOz Traveller app - this product has also had many updates (v1.6.14, v1.6.15, v1.7.2, v1.7.3, v1.8, v1.8.7, v1.8.8, v1.8.15, v1.9, v1.9.1, v1.9.3, v1.10.0, v1.10.2, v1.11.2, v1.11.3, v1.11.9, v2.0.0, v2.0.1, v2.0.3, v2.1.0, v2.1.1, v2.1.2, v2.1.3, v3.0.0, v3.1.0, v3.5.0, v3.5.2, v3.5.3, v3.6.0) and together with EOTopo offline maps is our core product. Please continue to support ExplorOz and our products - we are an innovative, grass-roots business that seeks to provide exceptional products and services unique to the touring and 4WD communities in Australia.